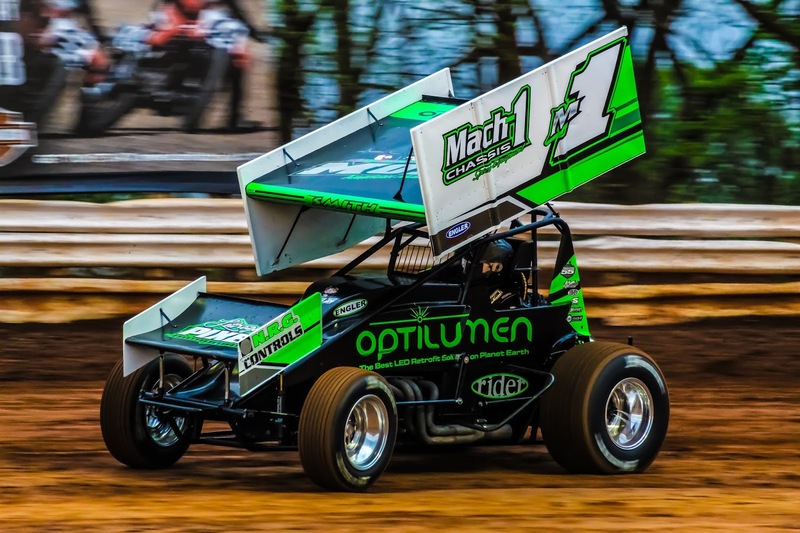 Mark Smith made it two-in-a-row for URC feature wins on Friday, May 25th. Smith was victorious at the Bedford Speedway on May 11th as well. Pole starter, Eddie Strada rocketed away on the initial start. After multiple restarts, Smith gave Strada many challenges, but it was Strada who continued to pull away. On a restart on lap five, Smith showed his veteran knowledge and beat Strada going into turn one. Once Smith was out front, he moved gracefully around the top line. On lap eight, Smith caught lap traffic, giving Strada and Jason Shultz a chance to catch up. Strada put the pressure on Smith every lap, but Smith continued to hold off the 42e. On lap 24 Shultz found his way around Strada but suddenly slowed on the front stretch, catching fire. Shultz was able to remove himself from the car quickly and the fire was put out in seconds. Robbie Stillwaggon and Justin Whittall were both caught up in an accident while Shultz slowed and were removed from the speedway. After a green-white-checkered start, it was Smith who crossed the finish line first, followed by Eddie Strada and Chad Layton.